Amble Gallery had its very first exhibition hanging this past Friday! We are gearing up for the opening with much hard work and help from friends. 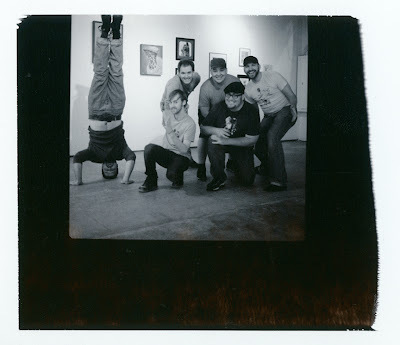 This polaroid shows all the playful and helpful heads and hands from Friday night. Thank you everyone! Hope to see you Thursday, October 4th, 7pm. Rock, rock on. Good pic, Now get some mair up!! Any of the opening itself floating about? How about more pics of the gallery? also........ah've pyoor booked ma flight!!! !